Loyola University Chicago is a campus committed to addressing climate change and making climate impacts on natural and social systems a key aspect of social justice teaching. In the past year— as part of a series of events around Pope Francis’ encyclical, Laudato Si’ — , Loyola released the university’s climate action plan, A Just Future, with a goal of achieving carbon neutrality by 2025. As Chicago’s Jesuit, Catholic university, Loyola is addressing the risks associated with climate through three main areas of focus: campus, curriculum, and community engagement. Loyola students organized a Climate Action Plan for the Edgewater Neighborhood. 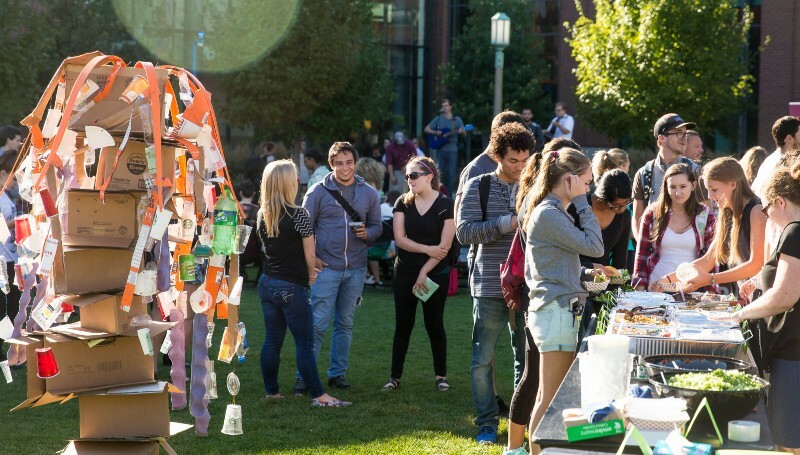 In recent months, a new Sustainability Committee was also organized, consisting of high-level administrators to oversee and implement its Climate Action Plan and its student sustainability fund, The Green Initiative Fund. 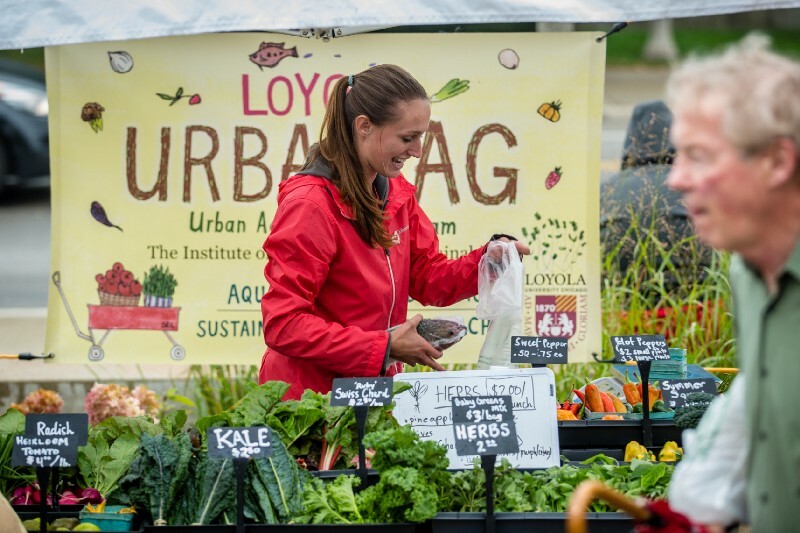 A Community Sustainable Action Scholarship, Compost Network, Storm-water Stories, a student-run farmers market (with 1–1 food stamp matching), food donations, and other sustainability programs bring Loyola’s sustainability strengths into its surrounding neighborhoods. 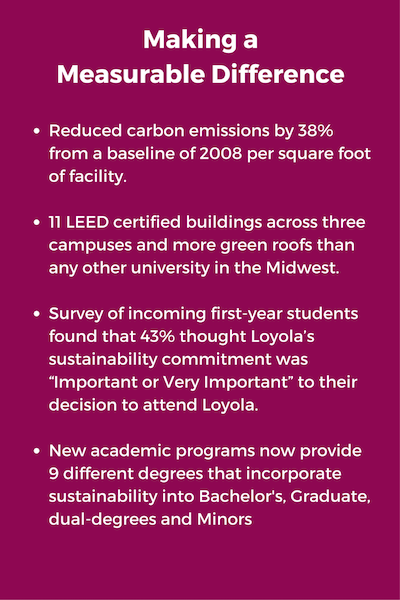 At Loyola, sustainability isn’t just something that stays on campus, it is a critical part of the University commitment to be agents for social justice in the community. As the 2016 winner of the Solution Generation/ACCU Climate Leadership Award, the university was commended for its partnership efforts with the Rogers Park and Edgewater neighborhoods, taking climate-action best practices beyond the campus. Loyola is focused on environmental justice issues to address pollution, reduce waste, and help communities adapt to the changing climate. 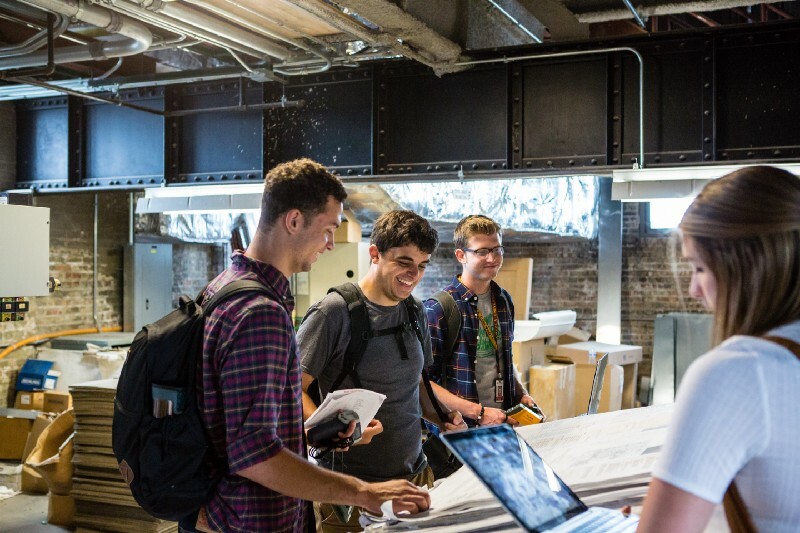 With communities more and more affected by climate change and its impacts, Loyola is starting in its neighborhood, engaging their community through dashboards, signage and a “campus as lab” program that allows students to work on improving the infrastructure all around them. Loyola is well known for their student-run biodiesel program which fuels shuttle buses and provides campus restroom soap all made from waste vegetable oil. University buildings are high-performance and energy efficient, and two campuses feature large-scale geothermal installations. Loyola’s Institute of Environmental Sustainability is currently building out the university’s environmental justice efforts, including developing a Community Climate Corps comprised of student interns from various disciplines who will work with the University’s Office of Community Relations and other campus partners to identify and develop community projects. The campus is busy scaling up their community efforts further, including tree planting, native garden development, home weatherization efforts, food waste reduction, produce donation, and storm-water mitigation efforts to reduce flooding. The Climate Leadership Awards Program was created to identify American higher education institutions taking the lead on climate change communication and engagement. Solution Generation, a program of ecoAmerica, partnered with the Association of Catholic Colleges and Universities to deliver the 2016 award to Loyola University Chicago. We would like to acknowledge and thank the following participants, receiving Honorable Mention: Carroll College, Salve Regina University, Edgewood College, St. Francis College, University of the Incarnate Word, Lourdes University, University of Dayton, Barry University, Saint Martin’s University, University of San Diego, Creighton University, Duquesne University, The Catholic University of America, Seattle University Center for Environmental Justice and Sustainability, King’s University College, and Iona College.